3.2 How Do Bumper Guards Work? Are you tired of all the dings, dents and black scrapes that your bumper gets both while driving and while parked? This can be really frustrating, to say the least. No matter how well you treat the rest of your car’s body, those little dings, dents, and scrapes really take away from its looks. Well, there is something you can do to help prevent dings, dents, and scrapes to your bumper. There are many choices in different types of bumper guards available in the auto parts marketplace. The best bumper guards will really help keep your car’s bumpers from getting unsightly dings, dents, and scrapes. In this article, we will help you learn more about vehicle bumper guards. We will do that by telling you what to look for in bumper guards when shopping for them. There will also be some informational bumper guard reviews. When you are done reading, you will have a good idea which car bumper guards will work best for you. Here are some reviews on what we feel are the best bumper guard designs that you will find in the auto marketplace. BumpTek has come up with a very easy to install and innovative front bumper protector here. It conveniently fastens into where your license plate holder will go. Once installed you just slide the license plate back into a specially made pocket in the side of it. 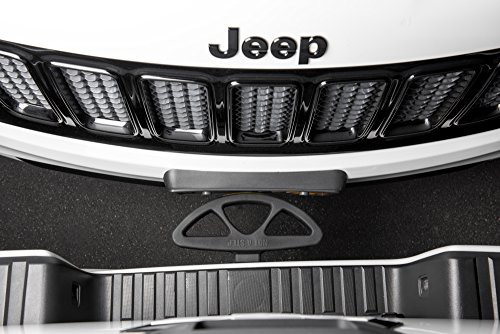 This bumper guard will protect your car’s bumper while it is parked or if you slightly bump another car while you are trying to park. It’s made out of pliable and thick rubber that stays soft even in colder weather conditions. That piece of rubber offers 1 ¾” thick protection for your front bumper. This bumper guard is so unique in the way it works it even has a patent pending. This is a very nice rear bumper guard that stretches all the way across the back of your car. It measures a full 62” long and 6” in width. That’s a very generous amount of protection for the dings, dents, and scrapes that often happen in parking lots. Not only will it protect your vehicle, but it looks good while doing it too. This bumper guard is made of tough weather and UV ray resistant EPDM material. That’s the same type of durable rubber that protects the roofs on many commercial properties. 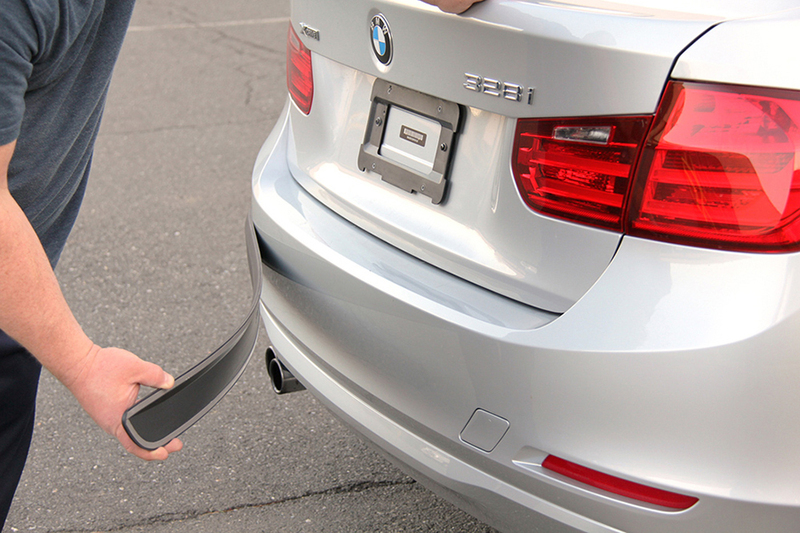 This BumperX bumper guard adheres strongly to your car but it can be removed also if you wish. Here is another popular front license plate style pumper protector. It does a nice job of protecting your bumper due to its 2” extra-thick, V-Tech all-weather foam material. 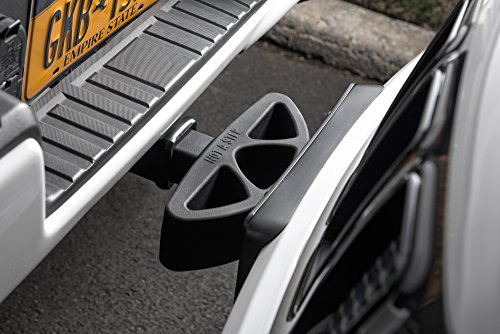 This bumper protector will fit most any vehicle that’s made. It even has a surface that is nicely ‘military textured’ to offer even more dent, ding or scrape protection when it comes into contact with an object or another vehicle in a parking lot. It installs right in the same place your old license plate holder did. Then you simply reattach your license plate again too. It measures 14” in width and over 8” in height. You will find a few bumper guards that protect as well against low impact parking lot bumps. This is a very unique but powerful rear bumper guard. It actually fits into the receiver portion of a 2” hitch setup similar to the best hitch cargo carrier. 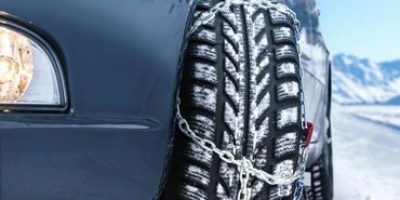 That keeps any vehicle that bumps you lightly in the rear in a parking lot far away from any area of your bumper it can damage. The super-duty flexible rubber it’s made of absorbs and repels the energy from a big bump. It also features a blackout log and stealthy, sandblast textured surface. That means that it looks good and is not an eye-sore when attached to your vehicle. 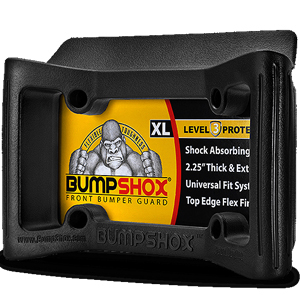 This 11 ½” wide bumper guard also weighs 5.7-pounds and that offers some additional heavyweight protection in itself. 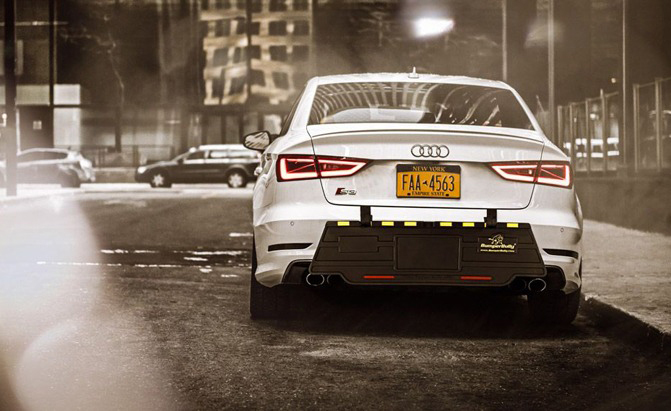 This is the first trunk-mounted rear bumper guard on our list. That makes it very convenient and easy to put this bumper guard on and take it off. It covers a huge area on the back of any car it’s placed on. That’s because it measures a very generous 40” inches in width and 12” in height. 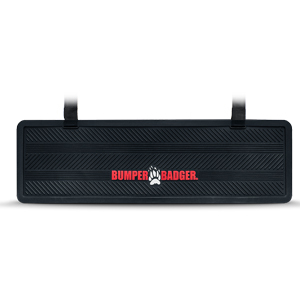 The BumperBadger rear bumper guard is not made to be used while driving. It installs easily into the front of your car’s trunk. After you have arrived at your destination you simply open your trunk and flip it into place. It’s made using quality all-weather rubber with raised rib cushioning to protect rear bump impact zones. 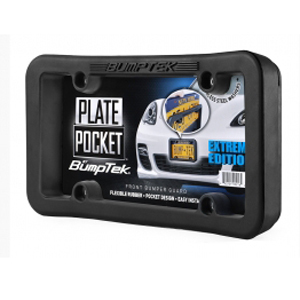 Here is the second BumpTek product on our review list of the best bumper guard products. That should tell you something about the thought and materials that go into their bumper guard designs. This is another stick on rear bumper guard from them that has a distinctly European style to it. BumpTek even thought to include the surface cleaner to prep the bumper before installing. This bumper guard covers a lot of your car’s angled rear bumper impact zone. It measures some 53” and is almost 3” in height. It’s made using all-weather rubber that does not hurt your vehicles looks when it’s applied. The 3M adhesive helps it stay on strong but it can be removed with some elbow grease if you wish. Here is what we feel are the main bumper guard characteristics you should consider when looking for a new one. Most bumper guards only protect certain bumper locations. These are usually the front bumpers, rear bumpers and some protect bumper corners too. There are very few that are universal in fit and if they are it will probably be a smaller bumper guard. Be sure you are aware of the bumper location that any bumper guard you are thinking about buying targets. That way you can be sure to get the ding, dent and scrape protection you need where you want it. There are several different types of bumper guards that are made. We can’t begin to cover every single type here but we will talk about how the most popular types are used and how they are installed. As the name says, these types of bumper guards attach to your bumper by means of a special adhesive applied to the back of them. Don’t worry because this is not common everyday adhesive and it’s super-strong in most cases. With a little hard work, these can be removed and cleaned when the time comes. They are specifically designed for specific types of bumpers and specific places on them. These types of bumper guards take a little more work to make work for you but they are the least unsightly too. That’s because once you mount them in your trunk they are only used when your car is parked. What this means is you physical have to flip them in and out of place each time you park or get ready to drive again. The best thing about them is they cover a wider area of your back bumper than most bumper guards do. These are probably the simplest bumper guards to install. They also can be taken off easily when the time comes too. That’s because they simply mount into your vehicles existing license plate frame mount. Once they are installed, there is a spot on them to reinstall your license plate too. They are usually the thickest form of front bumper protection you can buy. These are rare but very effective rear bumper guards. That’s because they make any potential impact zone far from your back bumper. They can only be installed on cars, trucks or SUV’s that have a preexisting receiver hitch setup. The nice thing about hitch mounted bumper guards is they attach and can be taken off very easily. They offer maximum slight bump protection but can be somewhat unsightly too. It goes without saying that you better know the dimensions of any bumper guard that you are thinking about buying. Here are some things to consider regarding that. Of course, you will want to know the length and width of any bumper guard you are thinking about buying. That way you will know the amount of bumper area it will protect; the more area the better in most cases. Some bumper guards are smaller and do not offer full side to side bumper protection. So be keenly aware of the length and width of any bumper guard you are buying. Why is thickness important in a bumper guard? It has to do with the cushioning of a parking lot impact. It only stands to reason that the thicker the material the more cushioning effect it will have when impacted at low speed. Thinner materials may only protect against slight dings and scrapes while thicker material may prevent dents from more forceful impacts. Most bumper guards are not one size fits all applications. As a matter of fact, most are made for very specific types of bumpers. You have to know if a bumper guard you are thinking about buying will fit on your bumpers shape or style. If not, you may just get stuck with a bumper guard that is totally useless for your vehicle. For example, license plate style bumper guards are made to fit pointed style front bumpers. There really are not many other types of bumper guards that work on this style front bumper. Stick-on bumper guards that go from side to side are made almost exclusively for rear bumpers that have a flat area. It’s important to match the bumper guard you will buy to your bumper shape and style. You don’t want to be replacing bumper guards on a regular basis. That means you want them to be made of quality material that is durable, looks good and doesn’t easily fade. Most are made of high-grade rubber or some sort of extremely compact foam. You want to make sure the material is both weather and UV ray resistant too. So be sure to take a close look at how any bumper guard you want to buy is constructed. Pretty much all bumper guards are removable. With that being said, not all of them can be easily removed if you are thinking about taking them off and reinstalling them on a regular basis. Trunk style bumper guards are the easiest to remove and they are not even used while driving. 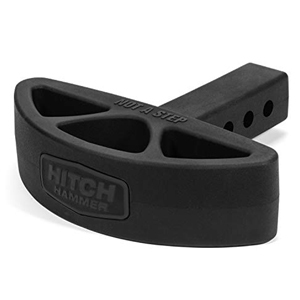 License plate type bumper guards are usually very easy to take off and reinstall too as are hitch style bumper guards. The only bumper guards that are somewhat permanent are stick-on bumper guards. They can be removed but it will take a lot of strength and sweat to accomplish this. What is the main purpose of installing a bumper guard on your vehicle in the first place? That’s right; to help maintain the way it looks. 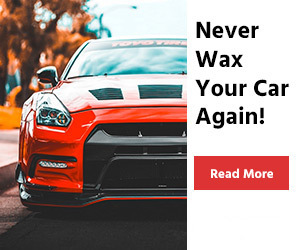 It’s for that very reason you only want to put on bumper guards that look good while applied. Some are even designed to complement the looks of your vehicle in the same way that decorations such as pinstriping do. You can afford to be a little choosey in this area and find a bumper guard that protects and looks good. It goes without saying that most bumper guards are made to be easily installed. That’s what makes them DIY items for the most part. It is a little more difficult to put on stick-on bumper guards’ as opposed to other types. That’s because of their adhesive and the placement accuracy they require. But it’s still not something most people would feel is difficult to do. Hitch mounted, license plate style, and trunk mounted bumper guards all can be easily installed with little effort. It’s no secret that these days most people are always in a hurry when they are going shopping or running errands. This rush to get things done often leads to carelessness on some people’s part. It’s the main reason why your car is prone to getting dents, dings, and scrapes from parking lot mishaps. That’s why it’s so important to get proper bumper protection these days to help your car’s body maintain its good looks. Bumper guards serve another important purpose too. They actually help you maintain the resale value of your vehicle. All those dents, dings and scrapes on your car not only hurt its looks but they also make it less appealing to potential buyers when you go to sell your car. They help prevent unsightly dings, dents, and scrapes in parking lots. Bumper guards help keep your car’s resale value higher. They can save you money on expensive insurance deductibles. Well-designed ones can actually improve the looks of your vehicle. Shopping and running errands will be more worry-free as far as vehicle damage goes. You no longer have to park in the far reaches of a parking lot to keep your vehicle protected. They are a very practical and inexpensive way to give your car extra protection. How Do Bumper Guards Work? The principle behind how bumper guards work is really pretty simple. Anytime you add a layer of protection it tends to reduce impact force and the resulting damage. Think of it like this. If you go to sit down hard in a wooden chair you tend to feel it pretty strongly. If you throw a cushion on that same chair and sit down with the same amount of force, you don’t feel it as much. That is exactly how bumper guards work. Bumper guards are no more than strategically placed layers of cushion for your car. When applied in the right places and installed the right way, they can really help prevent damage from light bumps and other minimal parking lot mishaps. We consider stick-on bumper guards to be the hardest to install. That’s because you are working with a glue backing so you have to be accurate when putting them on the first time. Here is how we suggest you install them. Step 1: Prep and clan the bumper surface you will place them on. This is the key to getting your stick-on bumper guard to stay in place for a long time. Step 2: Grab a friend if your stick-on bumper guard is over 2’ long. Otherwise, you will have difficulty placing it accurately. Step 3: Instruct your friend where it needs to be placed on the bumper. Step 4: Line up accurately and then push in place. Step 5: go over the length of it with your hand so the entire bumper guard is contacting your bumper’s surface. 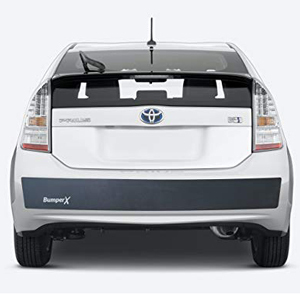 Trunk mounted bumper guards are secured in place in your trunk by special straps. You usually have to fasten these straps using special screws. Before you screw the straps in, make sure your bumper guard will fall into place correctly when installed. These are very simple to install too. You take off the license plate holder and screw the bumper guard into its place. Then simply reattach your license plate to the bumper guard. These are by far the easiest types of bumper guards to install. That’s because they simply fit into an existing receiver type hitch. You simply insert them and put the holding pin through the side of the hitch to secure them. When it comes to installing any type of product, follow the manufacturer’s directions to the letter for best results. Question: Can I use a license plate style bumper guard on the back of my vehicle? Answer: It’s possible in very rare situations. Such as if your vehicle rear bumper is fairly flat. In most cases, it’s not recommended unless the manufacturer says it’s ok to install it in the rear of your car. Question: I am getting ready to sell my car and it has stick-on bumper guards on it. Will these types of bumper guards damage my car when I go to remove them? Answer: They shouldn’t as long as you don’t use tools to help pry them off. Manufacturers know that people do not leave bumper guards on forever. Therefore, they use glue products that stick well but done harm your car’s surface. 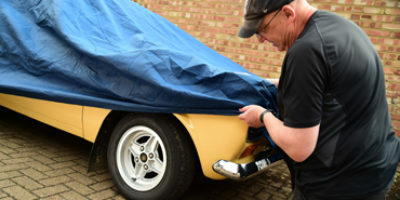 As long as you are careful when pulling them off, your car will be undamaged after removal. Question: Do bumper guards help you in roadway collisions when driving? Answer: The answer here is no and that’s not what they were designed for. Maybe the very thickest hitch style or license plate style bumper guards can help minimize whiplash in ‘very’ low impact collisions. Other than that they offer no protection in an at speed collision whatsoever. Question: Is it always best to get the biggest size possible bumper guards for your vehicle? Answer: The answer here is no. Although bigger bumper guards do protect more area, often the key factor in protection is how strategically the bumper guard is placed on your vehicle. To check out in-depth reviews of all the latest models, head over to our backseat organizer reviews. There’s a reason why bumper guards have become so popular. That’s because they work and they are designed in a way so they do not hurt the looks of your vehicle. They are also DIY products that are fairly easy for anyone to install. Not to mention, they are usually very reasonably priced items too. Given all of this, there really is no good reason not to add them to your car. 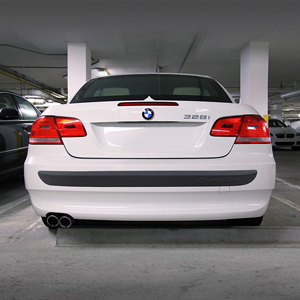 Make no mistake about it; the best bumper guards made today will really help protect your car’s looks. Some would even consider them essential pieces of auto equipment. To find one that’s right for your car make sure you refer to our bumper guard reviews and the advice we give in our bumper guard buying guide. If you do that, you will be well on your way to improving the protection for your car’s delicate auto body.